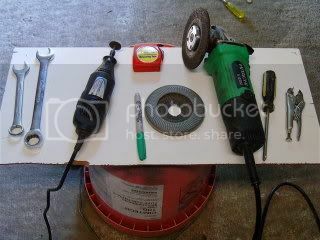 Place the vise grip on the main shaft the absorber, and the screw driver through the top eyelet. 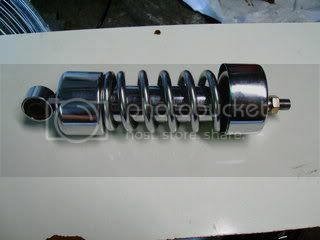 The stock spring length is 7" I Recommend not cutting more than 3/4" off of the spring. I CUT MINE TOO SHORT AT 5.5" AND NOW I HAVE TO MAKE SPACERS Using the Dremel to cut the spring is easiest way to do it b/c it is small and easy to work with. Start by measuring the spring and marking the point to cut, then get a squirt bottle of ice water to spray as you cut ( Go SLOW). SPRAY THE SPRING FREQUENTLY WHILE CUTTING. Know let the spring cool full before you start to level. Leveling is somewhat tricky but if you go slow and keep it cool it is simple. The pic shows what it should look like after your done I used a the Angle grinder with a HD grinding disk and Sand paper flapper disk to grind it down. Let it cool fully again. Followed by the cover. make sure the grooves lineup. I'm glad to see that someone has posted this topic. 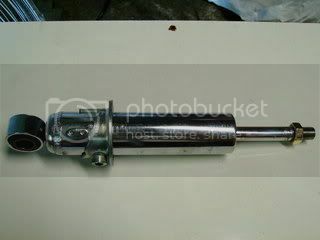 I disassembled my shocks to remove the bottom covers so that adjusting the preload would be easier. 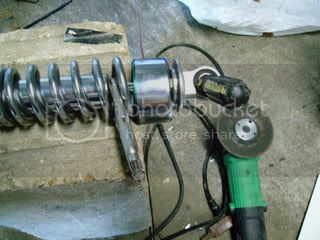 Another way to disassemble the shock is to use 2 vise grips (or rig something in a bench vise) and compress the spring, first. 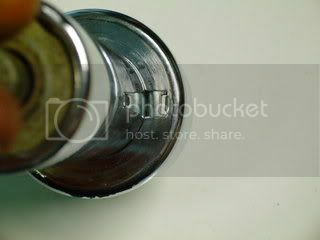 That exposes the rubber cushion and jam nut under the chrome cover (just visible in photo #2). 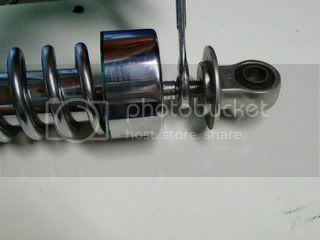 Then you can put a wrench on the jam nut on the top of the shock (photo #4) and remove the top mount. If the shock rod turns in this step, a 3rd vise grip can be clamped on the rod just below the threads (the part normally covered by the cushion). I think Savage Greg was very diplomatic in the way he posted the alternative method for disassembling these shocks. 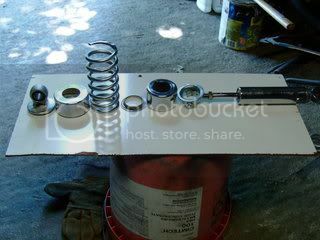 I just took mine apart so I can shorten the springs and strut rods to lower the bike a little. 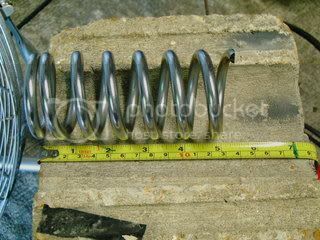 To take these shocks apart you may need to modify (ie s-bend) a 17mm spanner to get through the spring coils to the lock nut under the top mount unless you have a special set of small spring compressors. The threads on mine were TIGHT. I needed a prybar tube on the spanner and a 2 foot long round bar through the eye of the mount to start the nut coming off, and it remained very tight for over a full turn. 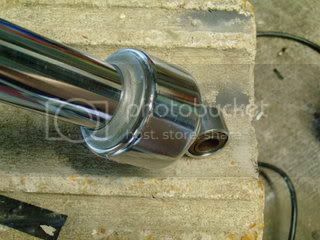 Try doing this using just vice grips on the shaft and guaranteed you're going to trash your strut - the chrome plate on that rod will not withstand even pliers, it will be utterly buggered by vice grips. As Savage Greg says, get up to that lock nut and if the shaft turns with the casting eye after you've loosened the locknut you may need to use grips just to stop the strut shaft spinning as you rotate the end, but use plastic jawed grips just to prevent spinning once the thread is moving or use steel grips at the very top of the shaft where the bump stop was originally. Don’t use force with steel grips on any ‘working’ part of the rod unless you like buying new struts. Cflow’s pictures seem to suggest locking grips onto the sliding portion of the rod to overcome the initial resistance of that tight thread at the end – no offence intended to Cflow but that’s a big, big no-no. Finally got round to sorting the shocks. I was going to shorten and re-thread the rods but after cutting 3/4" off the springs, the rods are still (just) holding the springs in tension on the softest strut setting, so no need to shorten. The cut-off ends of the springs go under the top shroud of the shock, but that area needed further modification to make sure that the springs seated centrally, so I had to make a 'top hat' spring seats out of brass and a steel seating washer. I'll find out where the ride height is in another week or two, but from a little trigonometry I've done with the rear end that shouldn't have lowered it too much, and I do have the option to wind up the preload (max preload now will be about the same as minimum was before). I'm expecting the back of the bike to be lower by about 1.5". 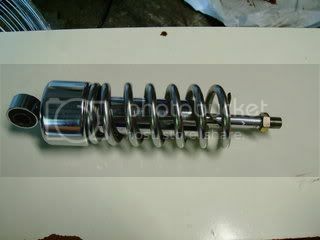 If it’s too soft and bottoms out, I have Plan B – found a supplier of 255mm shocks. At about $160 a pair they’re cheap shocks, but still £80 I’d rather not have to spend. Bottom photos show the assembly without the top chrome shroud in place to to show how it fits together. 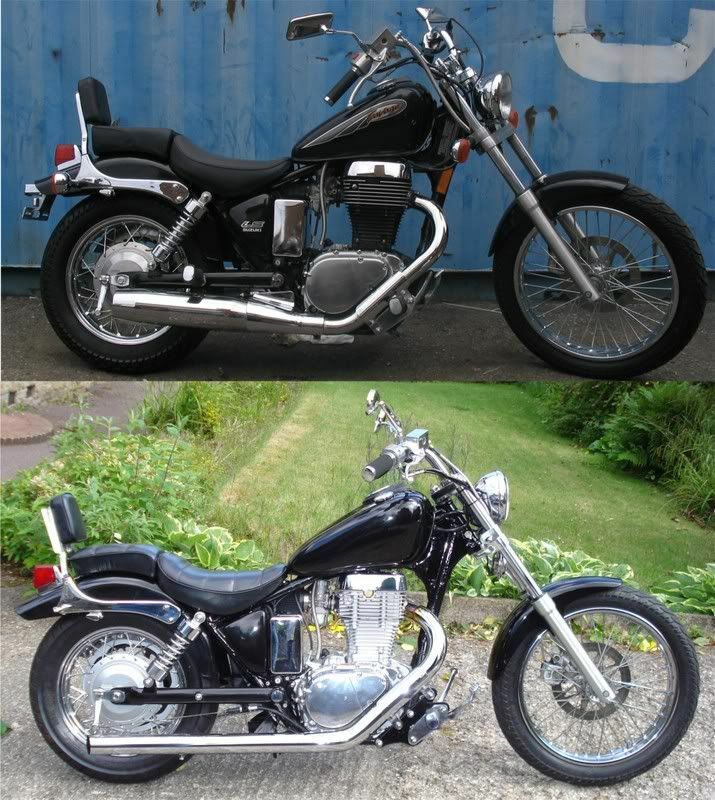 Well, here’s the bike with the shocks lowered, compared to a standard machine. Ride quality is fine. I weigh around 240lb in my socks, and with the shortened springs she only bottomed out once on a rough road, and that’s on softest setting, so I can stiffen her up and find maybe ¾ inch more clearance if I need to. 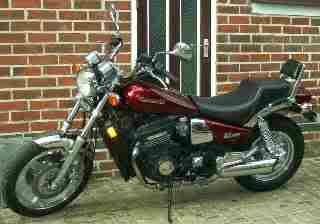 It won’t be good for a big rider and big pillion together, but that’s no surprise. 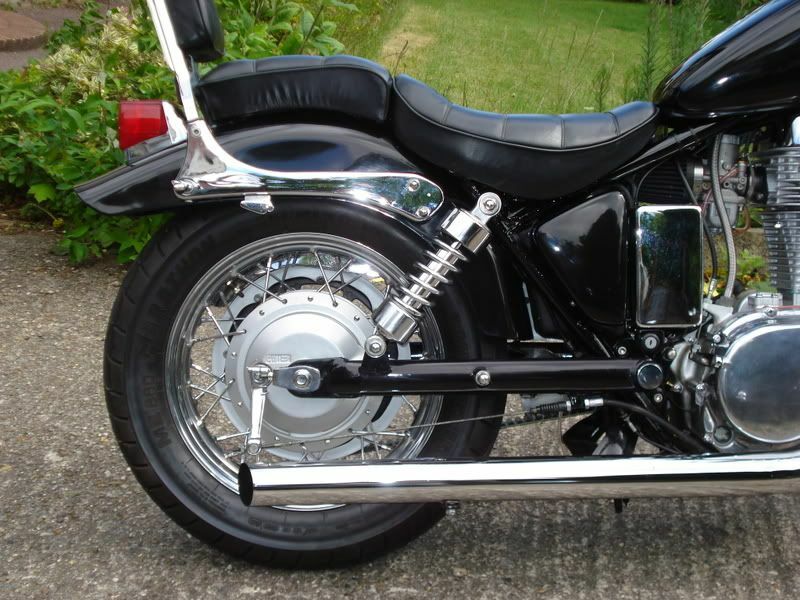 Ground clearance is reduced, as I was reminded by the odd protest from the bottom bracket screw under the exhaust – I switch from sport bikes to cruisers and have to be reminded that cruisers aren’t made to be laid way over round the bends. Overall, I’m delighted with the mod – it definitely works well and as long as you’re able to get your struts apart (without clamping onto the chrome shaft!!). It’s a cheap way to change the look and feel of your Savage. I lowered my bober another way. Instead of chopping the rear springs, I unbolted them and cut off the rear lower mount then located them 2" to the rear and welded them back on. With a little wire wheel and some sanding and gloss black spray paint it looks stock but lower. I have 2k miles and no issues. Ride quality is about the same and it looks cool. 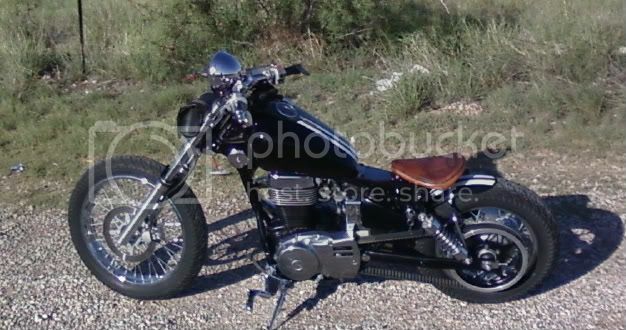 I dont know how this would work with a stock bike, mine has rear frame chop and custom seat mount so I dont have clearance issues. It seems easier than cutting the spring. I am currently working on a 165-15 car rear tire setup. Lee Parks says that lowering the rear adds stability and reduces steering quickness. I know, the lowering is done for appearance, and these are the handling results.